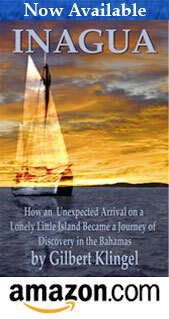 Like Robinson Crusoe upon another island, Gilbert Klingel was cast upon the odd and lonely little island of Inagua, One of the coral reefs of the sub-tropical Bahaman archipelago, Like Robinson Crusoe again, he made himself at home upon the little kingdom that became his own, where he ruled over a handful of blacks, the only folk who see the tiny island except for the few tourists who spy it on the gray horizon from the deck of a passing Ship, and little dream of the wonderland that it really is. So detached from the ways of civilization is the island that life goes on in the little island mocrocosm as if it were a world apart, and the rest of the world were all imagination, unreal and legendary. When Gilbert Klingel saw the rich variety of natural things that made up the environment of the island, limestone caves. coral reefs, pools of skyblue water, lizzards and crabs-and hummingbirds and flamingos and cacti and lichens and octupuses, he decided to settle down in a thatched hut where he might observe and study all that went on upon this isolated bit of Bahaman territory, and there he lived and wrote the record of what he saw and heard and felt, He lived the life of the sea and the life of the land. Beside the black folk who were his neighbors, on the island 3000 flamingos shared its hospitality, and whole hosts of other birds were regularly resident Or stopped on their migrations.